Developing international media organisations for a digital future. Philip Whitehall is helping to deliver content across award-winning digital platforms. He studied Computer Science with Games Technology at City, University of London before joining the broadcaster's digital media graduate scheme. Now Philip is a software engineer for an international media organisation in the Future Media department and is responsible for the development of the news website of one of the most prestigious broadcasters in the world. His career in broadcasting and web development started in 2006 when he was involved in online radio broadcasting through Radio Nintendo, where he produced live shows. He later went on to create XiinEngine, a platform for web development. Philip's freelance work allowed him to refine his skills as a developer and his time at City was also crucial for his career. He says: "City really helped me craft my career path, thanks to the Professional Liaison Unit and the wide array of modules available. The skills I acquired opened up many job opportunities after I graduated. My degree helped me with soft skills, like interacting with people and also with critical architecting skills." 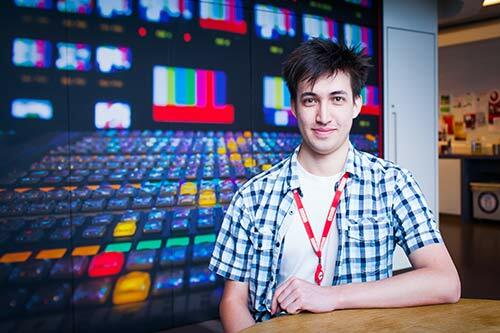 Commenting about his future ambitions Philip says: "I want to make a big impact in either the software or broadcasting world. Both mean a lot to me and I want to be involved with these ideas at a higher level in the future." He expects that his next big step will be to become a product manager, either within a large organisation or working independently. Find out where computer science at City could take you.